A recent slide from gigabyte has leaked in the official launch date of the AMD Bulldozer based FX- Series CPUs. According to the slide the new AMD CPUs will be launched on 7th June at Computex trade-show in Taipei, Taiwan. 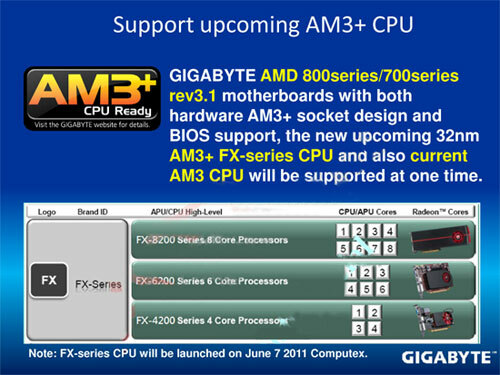 The slide details the upcoming AM3+ motherboards from gigabyte based on the AMD 800/700 series chipsets and would be able to support AM3 and AM3 + Fx CPUs at the same time. Also AMD had intentions to release its Bulldozer based platform pretty soon and Computex 2011 could be a great place to reveal the level of performance the new CPU’s have to offer. For more info visit the Source here.